Heron Lakes Golf Club is home to two championship courses designed by Robert Trent Jones Jr, the Great Blue Course and the Greenback Course. Both utilize the rugged natural terrain in different ways, offering challenges that will appeal to both low and high handicappers. 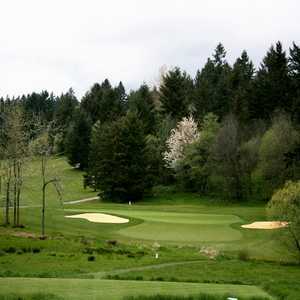 The Greenback Course is a versatile parkland layout that is gentle enough for beginners to approach with confidence. It is a less demanding design than the Great Blue but it still has plenty of challenges in store. There are 86 bunkers framing the elevated greens and six ponds come into play throughout however the mature trees present the most prominent threat. The par 3s on this golf course can be especially tough. The more challenging elements are nicely balanced by large, inviting greens and generous landing areas. Designed by: Robert Trent Jones, Jr., Robert Trent Jones, Sr. Greenback is a great track. It differs from Great Blue in that you have to maneuver the ball much more if you are going to score well. From the blues of both, Greenback is a more demanding course. The extra length is the only thing, in my opinion, that makes Great Blue rate tougher. My scores from the blues are almost identical, from the whites I score better on Great Blue. Go figure. We are very fortunate to have two terrific muny tracks next to each other for the prices. Not has hard as the "Great Blue" course.It does demand proper shot choices.